This past Friday I had the awesome opportunity to go to the world premiere screening of the Lloyd Alexander Documentary film at Brigham Young University. I was so moved. It's a wonderful film created by BYU film major Jared Crossley. Jared interviewed many people and traveled to several places to create this documentary. The interviews include a few local people including youth author and BYU professor Michael O. Tunnell (author of The Prydain Companion. A sample can be read here. 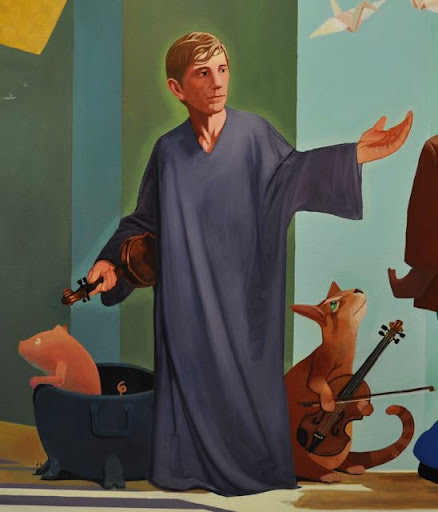 See my previous post about Michael Tunnell here) and former BYU professor Jim S. Jacobs (author of the Lloyd Alexander: A Critical Biography dissertation), both good friends of Lloyd Alexander. The film also featured BYU children's literature librarian Rachel Wadham, Newbery Honor winner and local youth author Shannon Hale, and Prydain artwork from BYU illustration professor Justin Kunz (shown left. 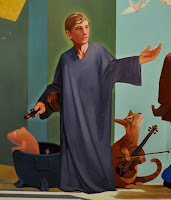 Some of his Prydain pictures can be viewed here). The simple and beautiful music of the film was composed by Celebration Chamber Orchestra director Stephen Vorhees (you can listen to his music in the trailer below) and the narration was done by Rick Macy, also a Utah native. I enjoyed the film so much, especially learning that while growing up Loyd Alexander had what he called an "eat and read program" (at least, I think that's what it was called). 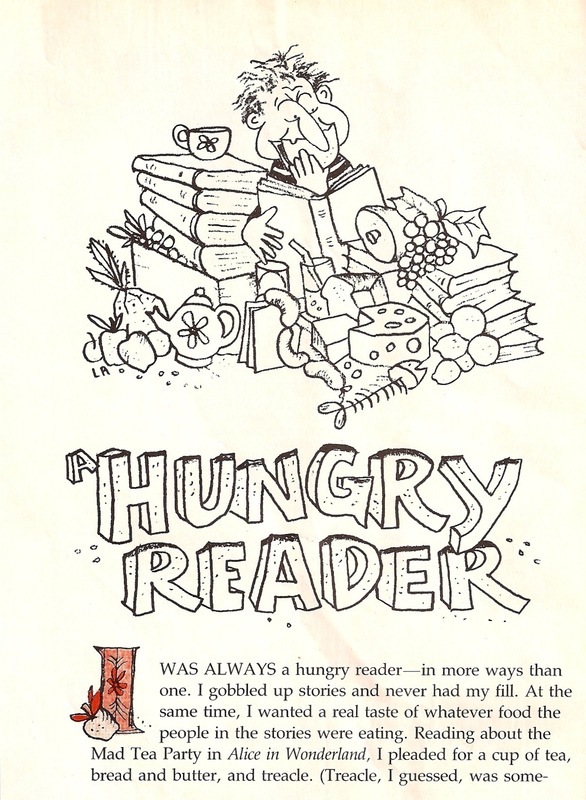 He loved reading so much that he wanted to experience the story on many levels, including food/taste. Huzzah! 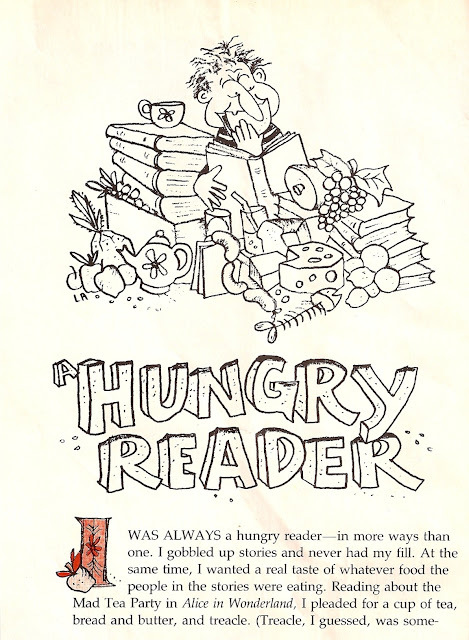 You can imagine how excited this made me because I love books combined with food! Below you'll find a short essay written and illustrated by Lloyd Alexander from the 1989 issue of Cricket Magazine entitled, "A Hungry Reader". He wrote this piece as an example for a kids contest for Cricket was running at the time, of which Lloyd was the judge. 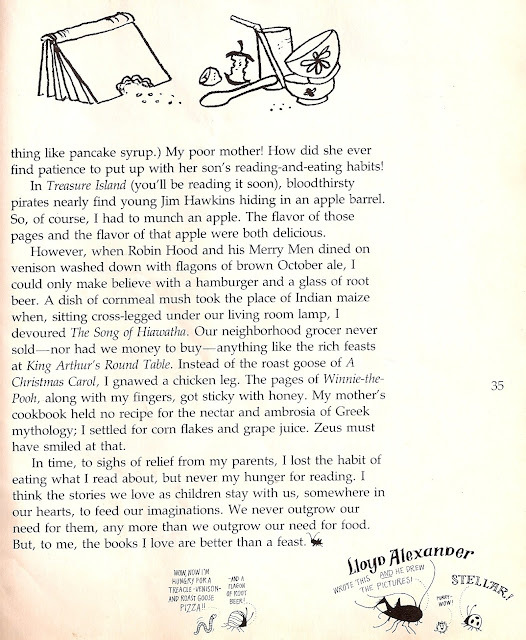 And yes, Alexander was also an illustrator (see the image at the bottom of this post for more proof). Did you know that "Lloyd" means "grey" in Welsh? I learned that years ago from Susan Cooper's Dark is Rising sequence. The title, "Brenin Llwyd" was used for one of the characters which means "grey king" (also, one of the books was titled The Grey King). Anyway, Lloyd Alexander was stationed in Wales for two months during World War II and fell in love with the place. 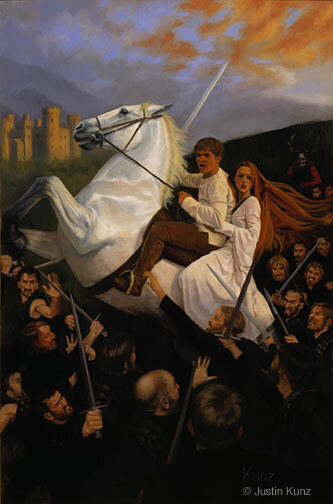 That experience, combined with his reading of the Mabinogion (a collection of medieval Welsh stories) and hero tales when he was younger, was the inspiration for The Chronicles of Prydain. This just adds more fuel to my fire of wanting to travel to Wales someday. 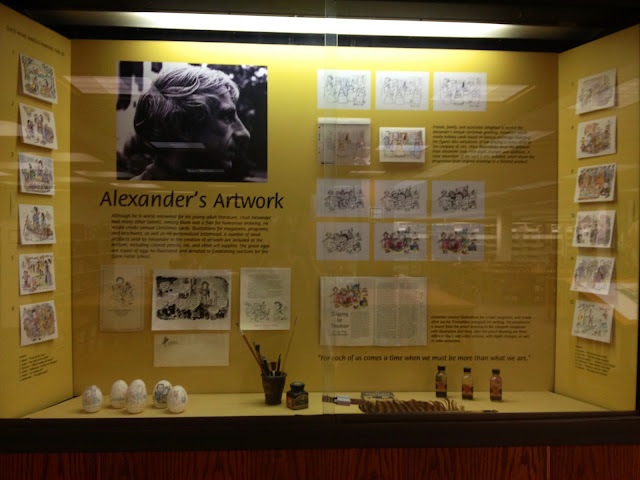 Public Screening of "Lloyd Alexander"
What: A screening of the full-length documentary open to the public. Tickets: Free. Seating will be on a first-come, first-serve basis. And yes, Disney did adapt Alexander's Prydain to animation in the 1985 movie The Black Cauldron (official page and trailer here), taking the name from the second book in the series. I totally remember watching it as a kid and loving it, though it was apparently a flop in the box office) and we even had the record with the read-along booklet. I still have that booklet somewhere, but alas no record. I don't have a copy of the film either, but I do have a keen little pin of Taran that my sister-in-law got me from Disney World. The most recent edition of the film is the 25th Anniversary Edition released in 2010 in DVD format. It's only $8.69 on Amazon! Did you know that the film took 5 years to make because of all of the editing, cutting, and revising? This was to be Disney's first attempt at a movie to interest teens, but the company wanted to keep it at a PG rating, PG-13 was a no-no. That must have been tough for the people making the film! I wonder if the creators had been able to keep the elements that would have make it into a PG-13 film if it would have done better at the box office. Check out this 2010 interview with the movie's producer, Joe Hale, for more info. Lloyd Alexander is one of my favorite authors!!! I might have to go to that showing. I hope you got to see it and enjoyed it! Interesting post Diana! Of course you know that I love food and books as well. :) And I loved The Black Cauldron as a child. I think it is one of the first stories that sparked a love of fantasy. Yeah! The movie seems to get a bad rap, but I totally loved it as a kid. It was atmospheric and mysterious and suspenseful and full of magic!